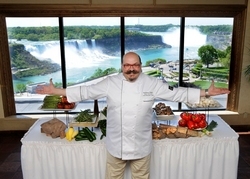 The Falls Avenue Resort is excited to welcome Celebrity Chef, TV Host and Author Massimo Capra back to Niagara Falls for a special Winter Harvest Dinner. 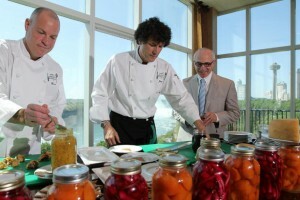 “A Night with Massimo Capra and Friends” is the third in a new culinary series at the Resort which features intimate dinners and meet & greets with the celebrity Chefs that call Falls Avenue home. Hotel Packages are available for the January 25, 2013 event at the Rainbow Room by Massimo Capra for only $189 per person. The package features one night hotel accommodations in a Fallsview Room at the Crowne Plaza Niagara Falls – Fallsview, a 6-course dinner with wine pairings by 13th Street Winery, and a Massimo Capra Culinary Gift to take home. Space is limited – Book Now! The majestic, Victorian lobby of the Crowne Plaza has graced the background of hundreds of wedding photos and decorous events, it will now spread across the pages of one of the World’s most iconic fashion magazines. The Crowne Plaza Hotel, located on Falls Avenue Resort, features crystal chandeliers, flowing drapes, elaborate details and colours fit for, well, Vogue Magazine. Photographer Malie Osborn of Marie Violet Photography chose the location for its notable character, created by the vintage details and rich golds and reds. The couture designs of Lizzi London will now be framed by the Crowne Plaza Hotel on the pages of Vogue Italy. Here are some of the photographer’s favorite photos, as well as the picture featured in Vogue Italy. Thank you to all those eager Fallsview Indoor Waterpark fans who got up early to help us welcome Jennifer Valentyne and the Breakfast Television Live Eye back to the Waterpark. 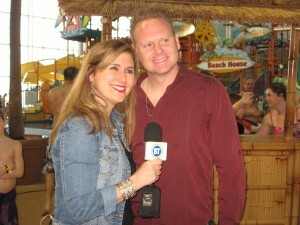 This was Jennifer’s fourth visit with the Live Eye, and drew the biggest crowd to date for a live broadcast from the Waterpark. It was a great morning filled with spills and splashes, sweet treats courtesy of the Hershey Store Niagara Falls and special guests. Most notably, Nik Wallenda who will make history with a tightrope walk across the Falls later this year, who flew in to be with us. 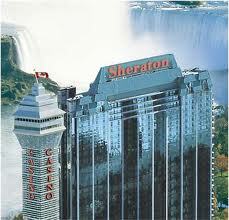 be broadcasting live from the Fallsview Indoor Waterpark on Monday morning. Valentyne will be joined by a special guest who has recently made headlines around the World – Nik Wallenda who has just received approval to tightrope walk across the Falls this summer. The fun filled segments air between 6:30 am-9:00 am as part of Toronto’s Number One Morning Show, Breakfast Television on CityTV. Don’t miss it! NIAGARA FALLS, Ont. – It may be heralded by many as the Honeymoon Capital of the World for the stunning natural beauty and wealth of accommodations that have made Niagara Falls so popular with couples. But Canada’s premier getaway destination is also scoring stellar reviews with families in a major online poll of travellers. 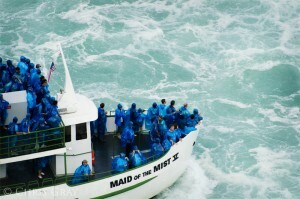 Niagara Falls received a coveted Number 1 ranking as Canada’s top family holiday spot in the recently released 2011 Travellers’ Choice Awards by TripAdvisor – the world’s largest online travel review community. In addition to the spectacular Falls that have been captivating visitors for over 200 years, the award recognizes Niagara for a wide selection of first-class family-oriented activities, attractions and entertainment it offers millions of visitors year-round. Featuring more than 1,200 hotel rooms connected to a 20-acre entertainment complex, the Falls Avenue Resort provides an ideal location for families to enjoy all the great amenities that helped make the destination a number-one holiday hot spot with travellers. In addition to its vantage point overlooking the majestic falls, the resort is connected to one of Niagara’s top family attractions — the three-acre Fallsview Indoor Waterpark, which has 16 thrilling water slides, pools and play areas. 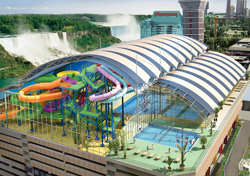 Guests staying at any of the Falls Avenue Resort’s hotels — Sheraton on the Falls, the Crowne Plaza Niagara Falls, Skyline Inn and the Hampton Inn by Hilton at the Falls — can take advantage of waterpark packages that include accommodation and four two-day passes to the indoor water park. 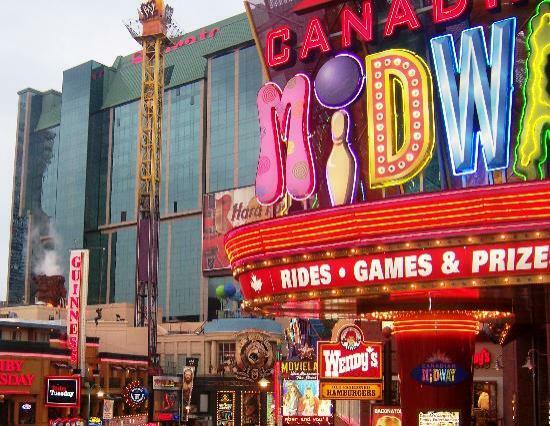 The resort also features the 24-hour excitement of Casino Niagara, cuisine of all kinds from Fallsview fine dining to themed restaurants and the largest selection of fallsview rooms in the city. Families can also indulge their sweet tooth at the Hershey Store, which serves up decadent fresh treats including milkshakes, chocolate-dipped strawberries, cookies, fudge, and favourite packaged items like signature Hershey Kiss and more. 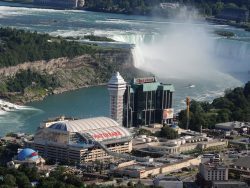 Book at stay at the Falls Avenue Resort and see for yourself why Niagara Falls is Canada’s No, 1 family destination with travellers. 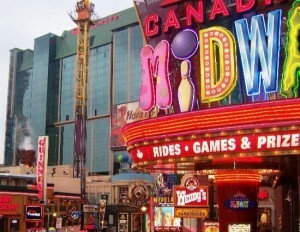 For short escapes or extended vacations, Falls Avenue Resort is Canada’s largest one-stop entertainment playground directly overlooking the majestic Niagara Falls. The resort features the 24 hour excitement of Casino Niagara, a three-acre year-round indoor waterpark, on-site attractions and activities, 1,200 rooms in three interconnected hotels with the largest selection of fallsview rooms in the city, 12 restaurants ranging from world-class cuisine to casual and themed dining, resort exclusive unique shopping; all just steps from Niagara Falls and with street level access to world famous Clifton Hill. Over 10,000,000 guest visits each year make Falls Avenue Resort Canada’s largest one-stop, year round, fun and entertainment playground. With so much to do and see, it’s the No. 1 choice for short escapes or extended vacations.